Showy and widespread throughout the ColumbiaBasin, the sagebrush buttercup is one of spring’s first arrivals, often blooming in February. 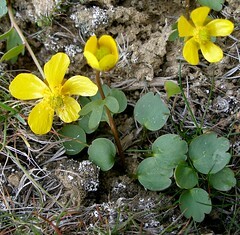 Frequently growing beneath large shrubs such as sagebrush or bitterbrush, the bright-yellow, shiny petals of the flowers contrast sharply with the dark-green, fleshy-lobed leaves. The attractive flowers usually exceed one inch in diameter with five (occasionally four, six, or seven) very bright, waxy-shiny, yellow petals. There are usually several stems that grow erect up to six inches tall, with the leaves springing from the base. Buttercups contain a potent skin irritant, called protoanemonin, that causes redness and blistering of the skin and mucous membranes. Native Americans often used it on their arrowheads as a poison. The whole plant was used to poison coyotes. A poultice of mashed and dampened whole plants was used to alleviate pains of any kind. A poultice of mashed leaves was also used for warts.